MainAll NewsInside IsraelWill United Torah Judaism oppose Ghattas’ dismissal? Will United Torah Judaism oppose Ghattas’ dismissal? Most members of the coalition, including Shas, joined the initiative to oust the Arab MK, but United Torah Judaism refused to sign on. Members of the United Torah Judaism faction refused to join the initiative of the Minister Zeev Elkin to apply the “Dismissal Law” against MK Basel Ghattas (Arab Joint List), suspected of trying to smuggle cell phones to imprisoned Hamas terrorists. Most members of the coalition, including Shas, have joined and added their signatures, including Prime Minister Benjamin Netanyahu. 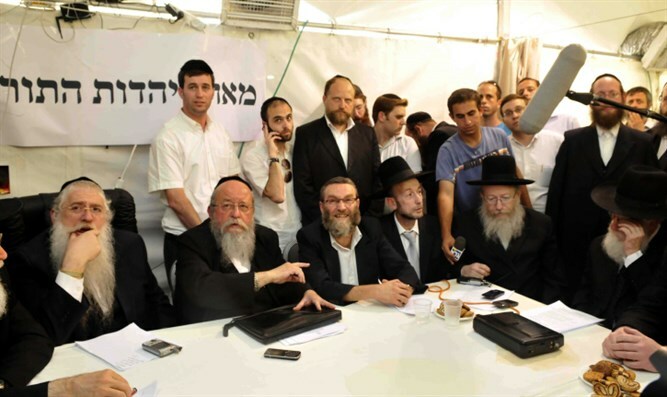 However, the United Torah Judaism faction, which is part of the government coalition, refused to sign the document. "MK Basel Ghattas crossed all the red lines," Shas said in a statement. '' Elected officials who smuggle mobile devices that may be used by security prisoners to plan and execute terror attacks cannot be members of the Israeli Knesset. " It should be noted that during the formulation of the Dismissal Law six months ago in the Constitution and Law Committee, MK Uri Maklev (United Torah Judaism) expressed his principled opposition to the law. "These are issues designed to be taken up by the Ethics Committee. It does not matter if we change the rationale or raise the number of MKs needed to support the dismissal process. This bill causes damage to the Knesset and its members," he said, drawing applause from members of the opposition. According to the new law, the impeachment proceedings would begin after the impeachment application is signed by 70 MKs, 10 of whom are not members of the coalition. Approval of the application will require the support of three-quarters of Knesset, 90 total MK’s. The bill was put together by the Prime Minister following the actions of Arab MKs Hanin Zoabi, Jamal Zahalka and Basel Ghattas of the Joint List's Balad faction, who caused a public outrage after they met with the families of Arab terrorists.